I feel a bit like that poor wee mouse whose well laid plans were sent flying when Robert Burns turned her out of her house with his plough. – all of which has meant that painting has taken a back seat until last week. 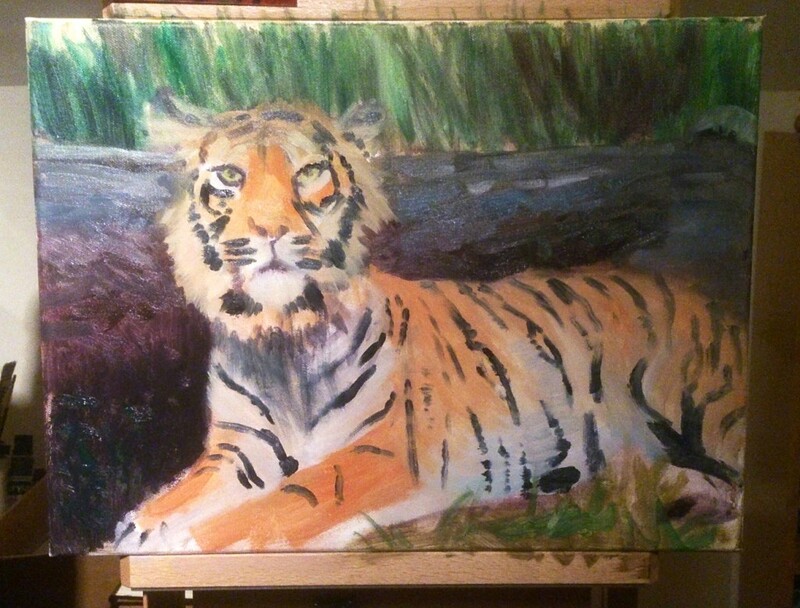 With a bit of “encouragement” from Norma, I put in a morning’s work and did a bit more to the tiger painting I started more than a year ago. Here it is in all it’s unfinished imperfection. I’m using water soluble oil paints but not sure that I really like the feel of these as opposed to old fashioned oils though. They’re not quite so silky smooth and rich as expected. Hopefully I’ll complete it soon and move on to what I really want to do, i.e., get outside again and paint “en plein air”, on the spot, in front of the motif! Unfortunately, I’ve now missed most of our balmy ‘Indian summer’ with the absolutely sumptuous autumn colours we’ve had this year, now fast disappearing. I will now have to face the colder air and less settled weather of the Scottish winter! Oh well, ‘no gain without pain’!